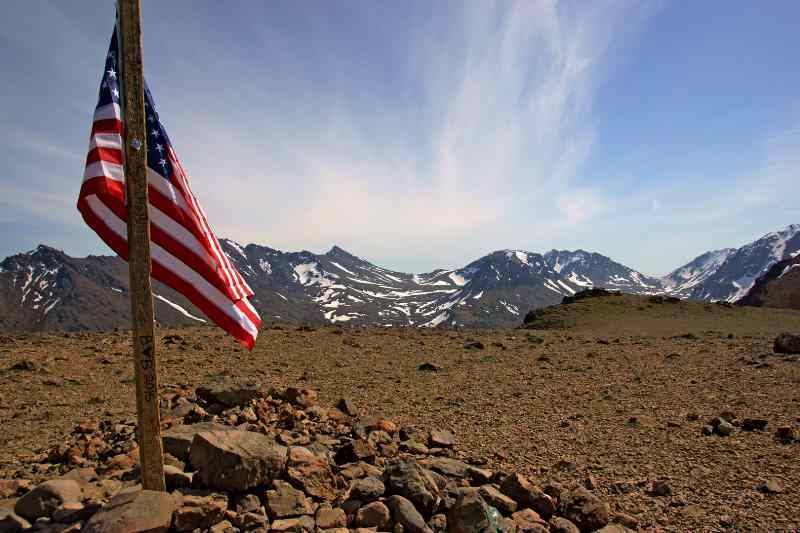 You don’t have to be in Anchorage for long before you figure out that the hike up Flattop Mountain is the hike in Anchorage. 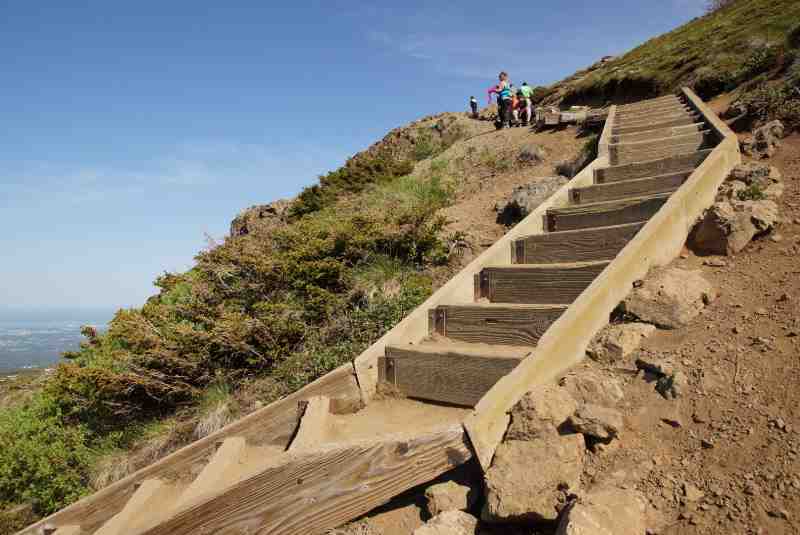 It has almost everything you could want: a good workout, a steep but achievable climb, stunning views all the way, and multiple options for sightseeing, once you’ve reached the top. Plus, it doesn’t require a long drive from the city, which means tourists and locals alike will be getting their exercise on this trail. 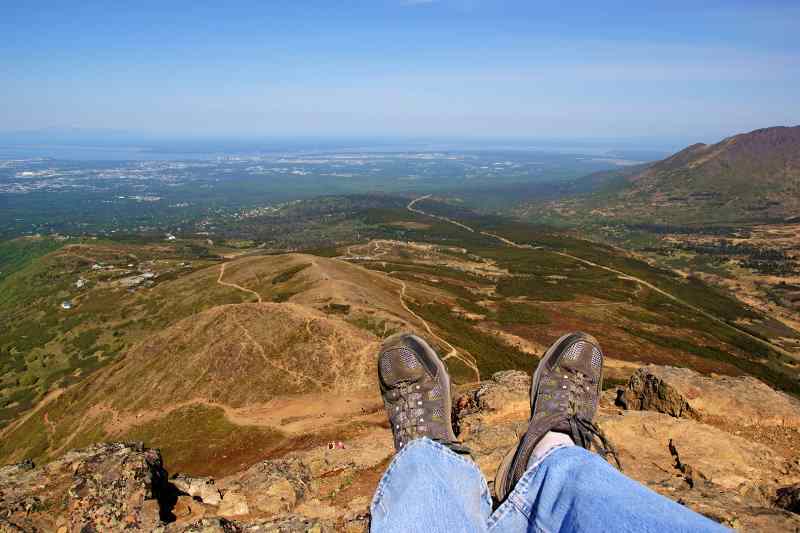 Flattop Mountain is located on the southeast side of Anchorage, just slightly above a residential neighborhood with some of the city’s best views. From Highway 1 on the south side of town, take the Rabbit Creek Road exit and head east. Rabbit Creek Road turns into Hillside Drive, then turn on Upper Huffman Drive, then Toilsome Hill Drive, which will then turn into Glen Alps Road. At the end, you’ll arrive at a large, and likely very crowded, parking area. 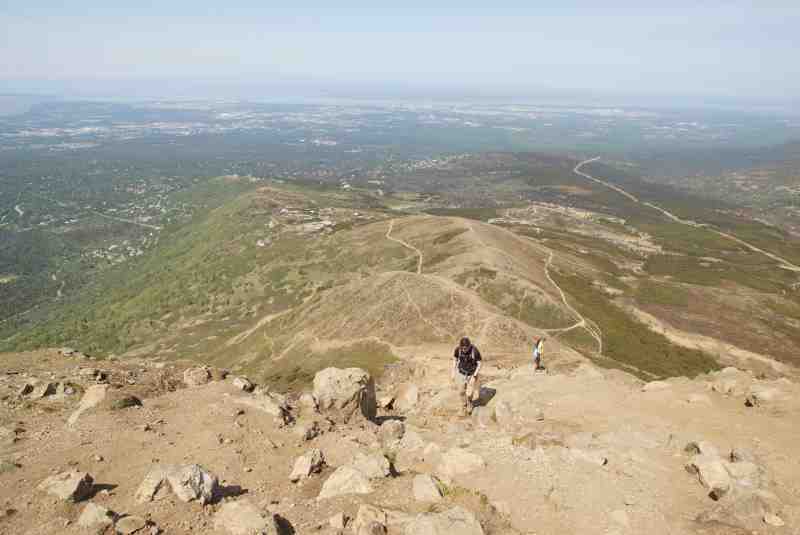 Obviously I wasn’t the only one who came up with the idea of hiking to the top of Flattop Mountain on this day. It was the last Saturday in May, the sky was blue, the air was delightfully comfortable. Oh, and the parking lot at the Glen Alps Trailhead was near capacity. I made a few loops and then got lucky with a parking spot. 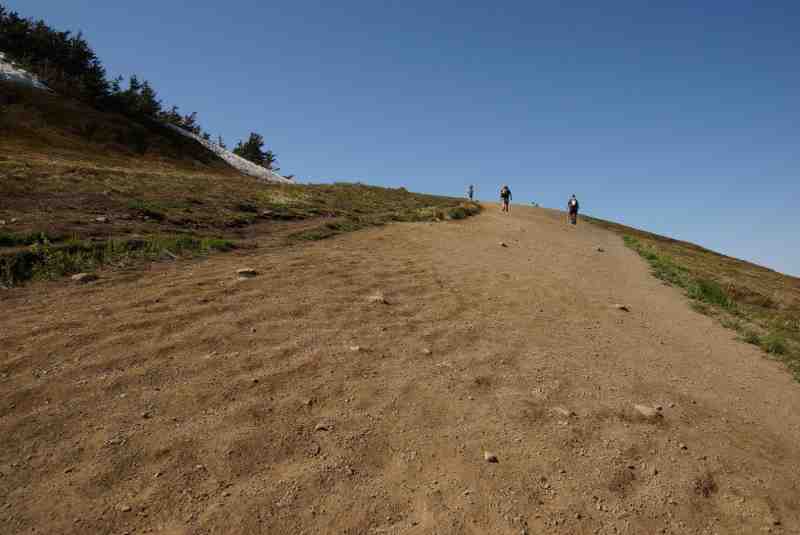 The trail up Flattop Mountain should not be mistaken for an easy one. 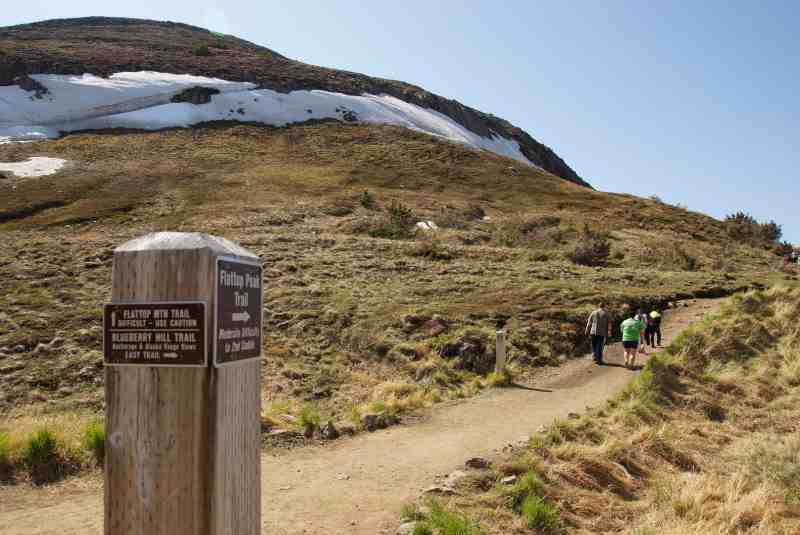 It’s 1.7 miles, one way, with an elevation gain of 1,300 feet. Do the math, and you’ll discover that you’re gaining one foot of elevation for about every 7 feet of forward motion. And that’s just the average — in reality, there are easy portions of the trail (like at the beginning), and exceedingly challenging parts. … because this is what is ahead of you. 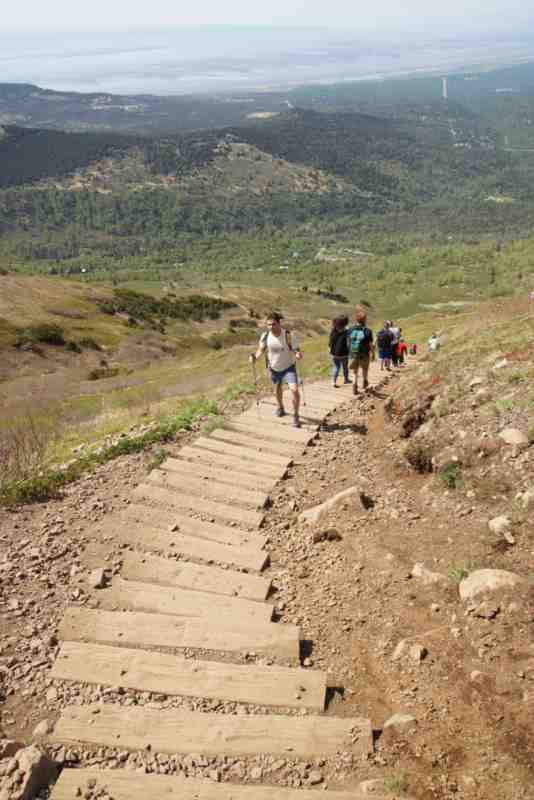 In this shot, it looks sandy, but for the most part, it’s an easy surface to hike — it’s just steep. … which is where the climb really kicks in. That really is the trail. It just goes straight up the side of the mountain. If there weren’t so many people already on it, you might think I’m lying. 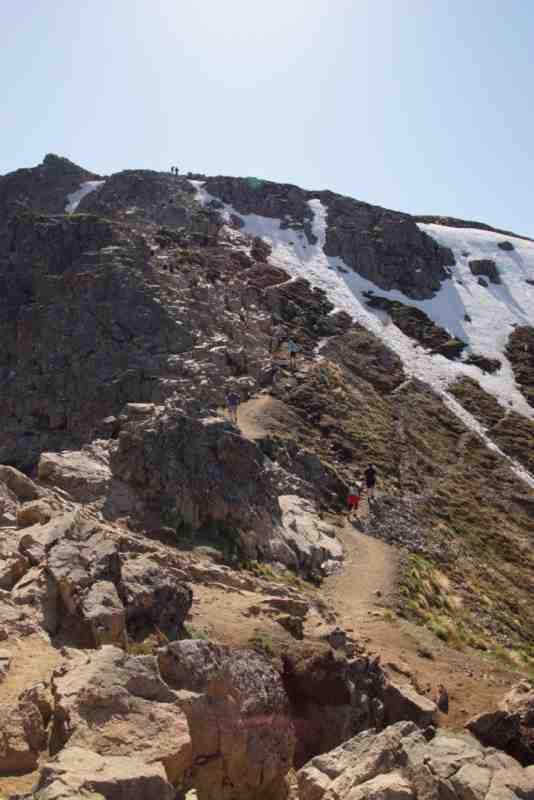 But it’s true — the path to the top of Flattop Mountain simply involves a whole lot of climbing. But when that climb is behind you, oh, what a view! I took a seat on some uncomfortable rocks which protruded into my backside, just to get the always satisfying feet-in-the-foreground shot of the landscape. 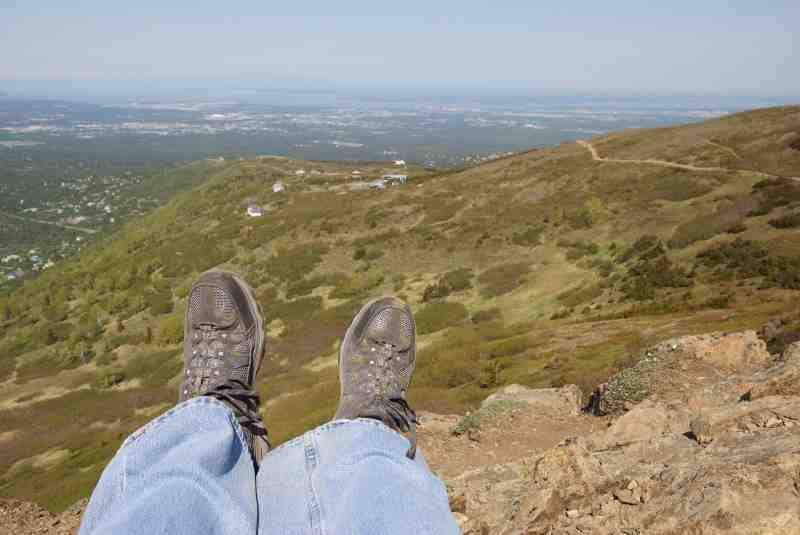 Just below my left foot, you’ll notice Blueberry Hill, and beyond, downtown Anchorage, and Knik Arm, and the rest of the Cook Inlet. Denali, or Mount McKinley, is also over in that general direction. 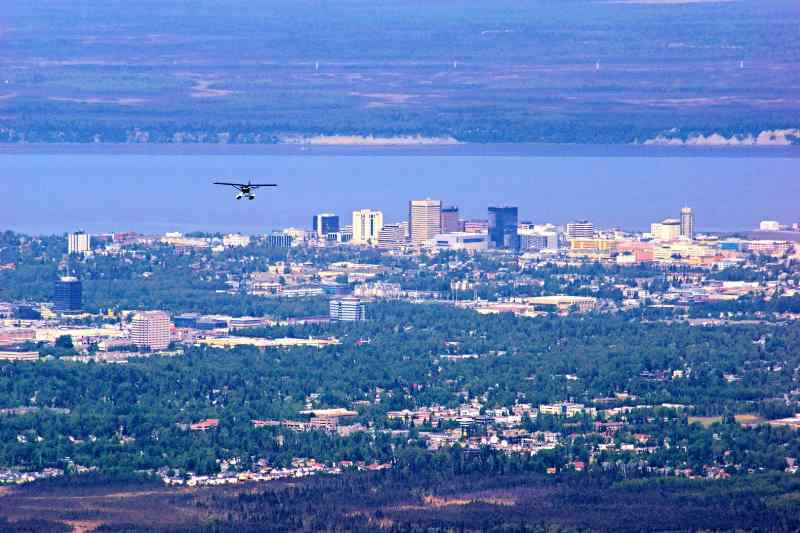 Sea planes are a popular way to get around Alaska, and you’ll probably see one after another, buzzing across the skyline on their way to the airport. 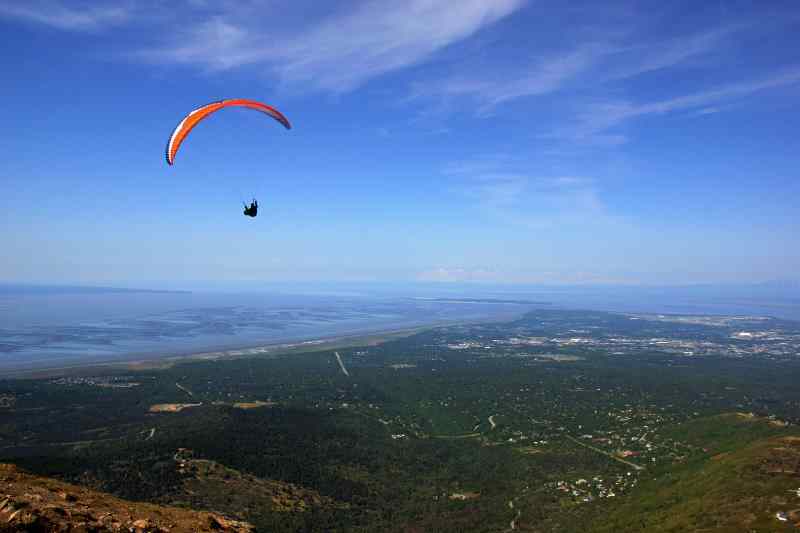 Flattop Mountain also provides a nice launchpad for Paragliders and Hang Gliders, so expect to see a few of them, as well. 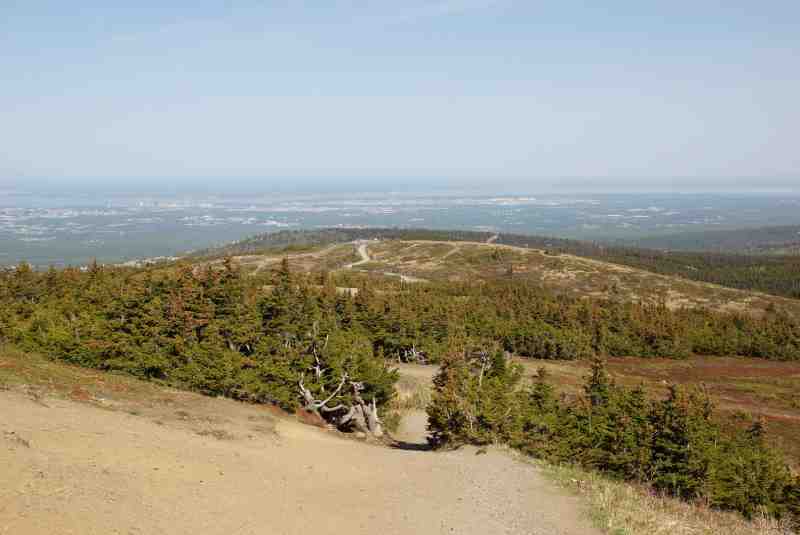 The top of Flattop Mountain is, well, flat. It shouldn’t be quite so shocking, given the name of the place, but when you reach the top and look around, it’s really quite remarkable. You’re free to wander around this tundra-like surface, and check out the view from any edge you choose. 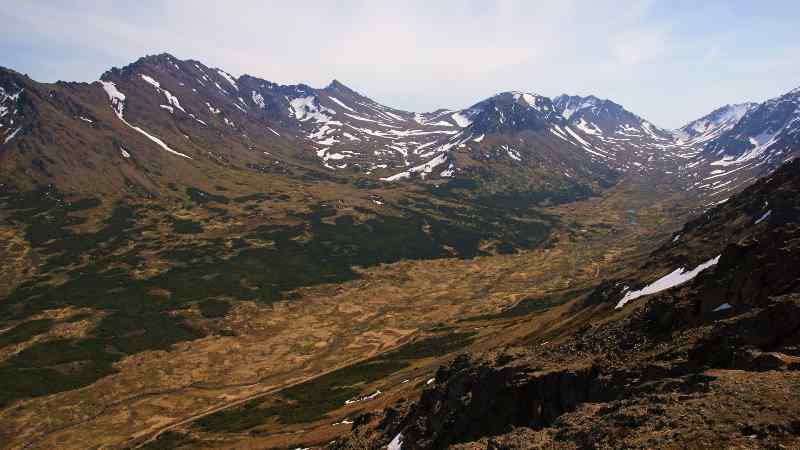 There’s a great view of the neighboring valley, looking back into Chugach State Park, and the Chugach Mountains. 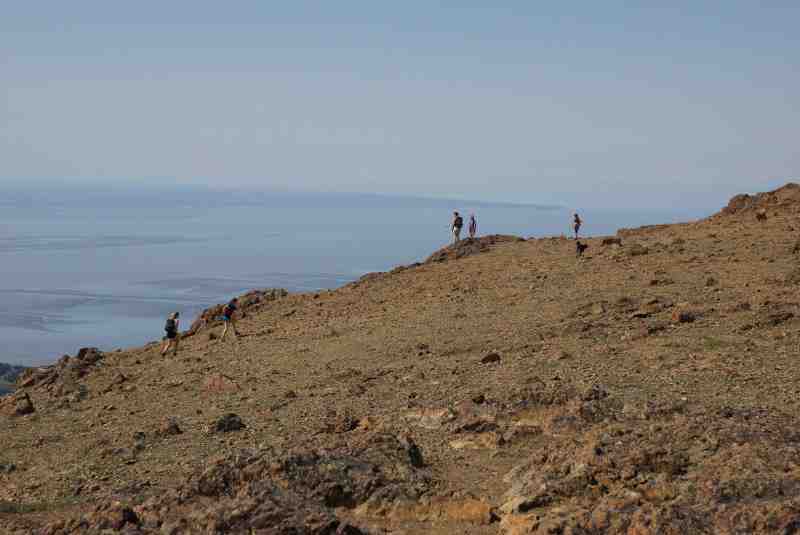 Look to the southwest, and you’ll see Turnagain Arm, and the Kenai Peninsula in the distance. 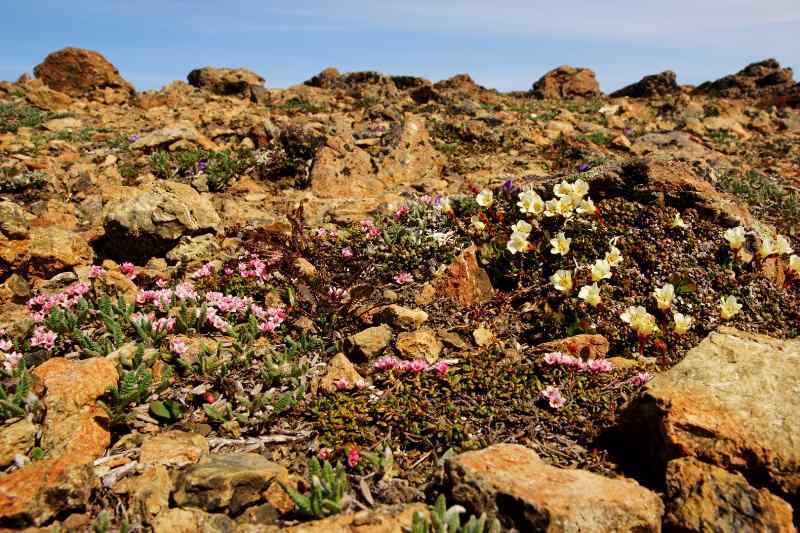 The top of Flat Top Mountain is covered with rocks and tiny, flowering plants. Once I had soaked in all the beauty I could contain, I knew there was just one thing left to do. … and back around the side of Blueberry Hill. Total hiking time, just a little over three hours — but that included a good amount of relaxation and exploration at the top. 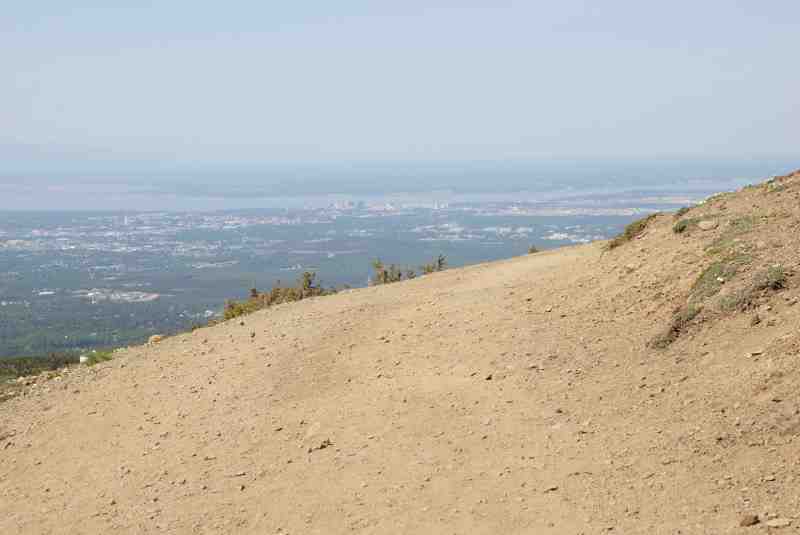 If you’re visiting Anchorage on a warm day in late spring, summer, or early fall, and you’re ready for a steep, but not terribly long hike, this is the place. Don’t expect serenity and quiet, because there’s no place to hide from all the other people on this popular trail. You will, however, enjoy some of the best views in Alaska, all within a short drive of the city.